Friday, March 5th, 1954. A young freshman congressman wakes up from a drunken stupor lying in the bottom of a ravine in Washington’s Rock Creek Park. Nearby is a crashed Studebaker…and the body of a young woman. So begins the story of The Hellfire Club, Jake Tapper’s first novel, but hopefully not his last. Jake Tapper is a leading correspondent and analyst for CNN’s Washington DC bureau. As such, he has seen the inner workings of modern Washington firsthand. In his debut novel, though, he turns his attention to an earlier era, the 1950s. Ike Eisenhower is president, Jack and Robert Kennedy are rising young stars, and Joseph McCarthy and Roy Cohn are headlining the news on a daily basis with their hearings on “the Red menace.” Tapper may not have been alive to cover Washington during that time, but he brings a journalist’s eye and a storyteller’s art to bring the time to life in this book. The Hellfire Club is a private, invitation only, club that is one of several such secret societies in Washington. It is so secret, in fact, that few know about it and even fewer will talk about it. There, barons of industry socialize with political leaders from both sides of the aisle. Deals are done, sins are shared, reputations are made and destroyed, and the real power in Washington is exercised. First-term congressman Charlie Marder gets swept up in this world before he knows what’s happening. His exemplary service as an Army captain in WWII Europe and his career as an academic at Columbia have failed to fully prepare him for the battle lines in Congress. Enemies masquerade as friends, true friends are hard to find, and successes become failures with the stroke of a pen. Even the strongest of relationships are tested in this kind of turbulence. Charlie’s wife, Margaret, is an academic herself. A zoologist, she is much more familiar with the workings of nature than of politics. Wild horses could drag her away–and they do. She leaves Washington to participate in a study of wild horses on islands off the coast of Maryland. This leaves Charlie alone in Washington. There, he finds that the taste of power and the pressures of the job lead to compromises he never expected to make, and he finds that he is not entirely the person he believed himself to be. Charlie and Margaret are wonderful characters. Neither are saints. Both make mistakes. Their journey together and their recognition of the other’s failings and strengths makes for a powerful story arc. There are times in the book when neither of them is particularly likable. Yet, by the end, I was cheering for each of them and for their relationship to make it. Any long marriage will face struggles–though most of us don’t have to confront the temptations or the threats that walk the halls of Congress. Charlie discovers that he is not the same person without Margaret. He needs her to be his best self–and that humility guides him (and them) through the powerful conclusion of The Hellfire Club. Tapper brings the transitions of the 1950s powerfully to life. It is easy to look back and gloss over the Eisenhower era as one of peace and stability. In fact, the dramatic transformations of the 1960s were already taking root in the previous decade. Black veterans were being elected to Congress–in very small numbers–but they were not allowed any real power. Women were seldom seen in any leadership roles. Mostly they were used by men in power as toys. Sexual abuse was not only tolerated but expected. Yet the book hints at the changes that were brewing. Margaret Marder has a career, one she intends to pursue even while her husband is in Congress and even while she is pregnant. Charlie’s one true friend throughout the book is Isaiah Street, an African American congressman from Chicago. These relationships help him survive the challenges facing him. Beyond their value to the story, though, Margaret and Isaiah help us remember how far we’ve come in such a relatively short time. 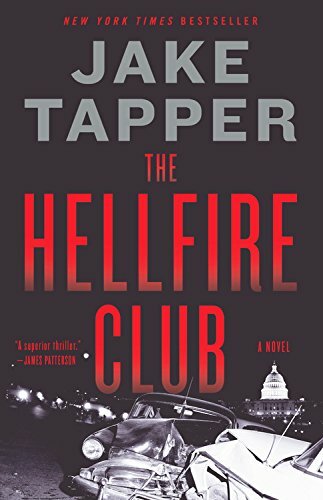 Tapper makes 1950s Washington come to life in The Hellfire Club. Within the first 50 pages we have appearances by the Kennedys, the Nixons, Lyndon Johnson, and other power players from history. It may be a book of fiction, but Tapper weaves actual historical figures into the narrative, along with actual events (such as a shooting in the Capitol by Puerto Rican separatists), to make it feel like we’re reading about actual intrigues and cover ups. The Hellfire Club may be a dangerous club to join, but it’s a wonderful book to read.